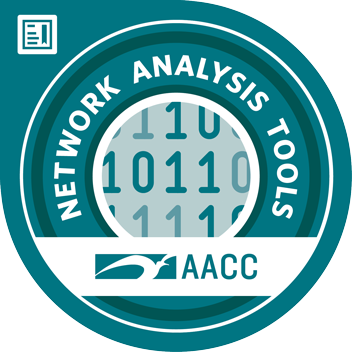 Individuals who demonstrate the standards listed below through the completion of CTR-395 Command Line and Scripting, CTU-322 Network Analysis with Wireshark and CTU 323 Python for Network Security, will be issued a Network Analysis Tools digital badge. This badge signifies that the holder has the practical knowledge, skills and abilities to use industry standard tools to perform everyday network networking and computing tasks, analyze network traffic and improve network security. CTR-395 Command Line and Scripting: This continuing education course is designed for individuals pursuing professional development training in command line and scripting, and provides instruction on command line usage for everyday tasks. Topics include command line usage for Windows and Linux for everyday tasks. CTU-322 Network Analysis with Wireshark: Learn practical network traffic and packet analysis tools practitioners use to monitor and secure networks. Explore the fundamentals of packet sniffing including protocols, collection, analysis, security-based analysis as well as others. Practice capturing and working with packets by using Wireshark in hands-on scenario based lab activities. CTU 323 Python for Network Security Analysts: Use Python for network analysis and security applications by exploring third-party libraries for network analysis, penetration testing and wireless security. Through guided scenario-based lab activities build a tool kit you can start using right away to solve real-world network security problems. Learn the basics of Python programming, how to use third-party libraries, and build the foundational skills you need to start writing your own scripts. Demonstrate how to use common network tools, Linux command lines and Windows command lines to perform everyday network administration tasks and incorporate scripting to improve efficiency. Successfully use Wireshark to analyze network traffic and identify vulnerabilities, demonstrate skill in using protocol analyzers and independently perform packet-level analysis. Show a practical understanding of the Python programming language by to developing custom tools using third-party libraries to solve network analysis and network security problems.